1. The pockmarked terrain of Mercury’s north pole harbors much more ice than scientists had expected. Mercury has much more ice scattered across its north pole than previously thought, new research suggests — both inside craters as well as in shadowed terrain between them. The small deposits add to a significant amount of previously unrecognized water ice, researchers said in a statement. Mercury may seem like a surprising place to find ice: Although nights can get as cold as minus 275 degrees Fahrenheit (minus 170 degrees Celsius), temperatures can soar to 840 degrees F (450 degrees C) during the day. This is more than hot enough to boil away any water on the surface. The idea that Mercury may have water ice emerged in the 1990s when Earth-based telescopes first detected highly reflective regions at the planet's poles, researchers said in the statement. The hypothesis was verified in late 2012 by NASA's MESSENGER probe, which had entered Mercury's orbit in 2011. After a successful mission, the spacecraft deorbited in April 2015, crashing into the planet's surface. But the wealth of information it provided is still fueling research today. In the new study, researchers from Brown University combed through old data from the MESSENGER spacecraft. They took advantage of readings from the orbiter's laser altimeter, which is generally used to determine map elevation, but also measures surface reflectivity, the researchers said in the statement. They found evidence of ice in three large craters that had been measured at an oblique angle, rather than straight down. Ariel Deutsch, the study's lead author and a planetary scientist at Brown University, estimates that these deposits may account for an additional 1,313 square miles (3,400 square kilometers) of ice. That's a quarter larger than the state of Rhode Island. The small-scale deposits scattered between the craters could add even more, though, the researchers said. Scientists believe the moon hosts similar ice deposits near its poles, and research models suggest that these deposits could roughly double the amount of lunar surface that could harbor ice. 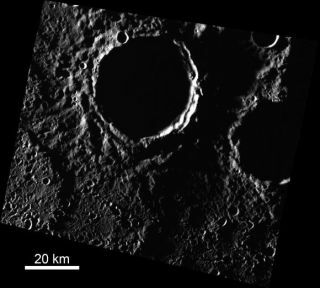 "The assumption has been that surface ice on Mercury exists predominantly in large craters, but we show evidence for these smaller-scale deposits as well," Deutsch said in the statement. "Adding these small-scale deposits to the large deposits within craters adds significantly to the surface ice inventory on Mercury." Scientists are still uncertain how water arrived on Mercury. According to the statement, their best hypothesis right now is that it was delivered by water-rich comet and asteroid impacts. Another idea is that hydrogen supplied by the solar wind combined with oxygen on the planet's surface to form water. These are some of the topics the researchers hope to investigate further.